Is Ford (s f) a tech company? It’s easier to tie Ford’s great age of innovation to the era of the industrial revolution than the internet revolution. But Ford Executive Chairman Bill Ford wants to convince both car buyers and the tech industry that one of the most iconic companies in American history is just getting started. Ford, of course, is more intimately tied to his company than most people; he’s the great-grandson of Henry Ford, who perfected the use of the assembly line for auto manufacturing and produced the first automobile that was affordable for middle-class Americans. You can think of Ford Motor Company as the first pioneer of mobility: Ford changed the definition of what it meant to be physically mobile with the Model T, and you could argue the sense of freedom the automobile imprinted on the American psyche has influenced the way almost everything since has been designed. In the intervening century, automotive technology evolved. Cars became more powerful, safer and more comfortable. They’ve become intelligent computerized devices. But no recent advancement in automotive technology has come close to the invention of the internal combustion engine or the techniques of mass production in the previous two centuries. Bill Ford, however, believes that the auto industry is entering a new age of innovation, one that will not only see the age-old combustion engine transform into the electric motor, but also see the world’s relationship with the automobile change. In his view, cars will not only become interwoven with our communication and digital entertainment networks, but they’ll be able to use that connectivity in ways no smartphone or tablet can. Cars will not only be capable of driving themselves but in some ways they and their drivers will no longer be independent actors. Instead, they’ll become an integral part of larger collaborative transportation networks. For decades, he said, Ford has moved in incremental steps, but the next decade will see some big transformations in his industry akin to the invention of the Model T. “Henry Ford would have loved what’s going on today,” Ford said. William Clay Ford, Jr. literally grew up in Ford Motor Company. His father is William Clay Ford, Sr., who ran Ford’s Continental division before it merged with the Lincoln line and today owns the Detroit Lions, while his grandfather was Edsel Ford, the only son of Henry and president of the company from 1919 until his death in 1943. Even on his mother’s side Bill Ford has cars in his bloodline; another of his great-grandfathers is Harvey Firestone, founder of the tire company that still bears his name. But coming from a family of auto magnates, Bill Ford, 56, is a bit of a contradiction. He’s been a self-professed environmentalist since matriculating from Princeton University, but upon graduation in 1979 he immediately began work for a company that has been the target of the environmental movement throughout his lifetime. He’s a vegetarian, and he tools around in Ford’s newest hybrid vehicles, but he won’t give up his numerous Mustangs — a car he’s driven since since he received his first 1975 model with a custom electric-green paint job. Ford took over as the company’s CEO in 2001, serving for five years in what he readily admits were the “darkest of dark days” for Ford. He hired former Boeing(s ba) CEO Alan Mulally in 2006 to restructure the company — in a year it reported its largest ever loss of $12.7 billion, closed plants, and laid off workers. But Ford said it was during those initial interviews with Mulally (who has been considered a leading candidate to replace Steve Ballmer as CEO of Microsoft) that the two laid the groundwork for the company’s current road map. They agreed to make two big bets on the automaker’s future: The first was to clean up its vehicles with the goal of besting all of its competitors in fuel efficiency. The second was to become a technology leader both under the hood and on the dashboard. Whether Ford has accomplished its goal of going green is debatable. Ford’s first consumer electric vehicle, the Focus Electric, didn’t emerge until 2011, a full three years after the Tesla Roadster debuted and a year after other groundbreaking cars like the Nissan Leaf and the Chevy(s gm) Volt arrived on the market. But Mulally and Ford have claimed that their greening effort was never focused solely on electric vehicles, but improving the overall fuel economy of its entire fleet through more efficient engines and hybrid powertrains. As a far as technology in the dashboard goes, the company made a big bet six years ago that seems to have paid off well. Sync started as a simple voice command system that allows drivers to control basic functions like the stereo and climate control with voice commands. But in 2010 Ford launched AppLink, which basically turned Sync into a development platform for third-party apps linked to smartphone. In its basic form, Sync is now in 10 million vehicles. It has an open developer program that has brought dozens of apps including Amazon(s amzn) Cloud Player, Spotify and Glympse into Ford dashboards. The automaker made some missteps along the way — its high-end infotainment system MyFord Touch was plagued by complaints over its buggy interface and tendency to crash. But overall Sync has proven to be a commercial success for Ford and has positioned the automaker at the forefront of connected car technologies. Ford Motor suddenly had to deal with software developers, which flew in the face of how it and automakers had done business for decades. Typically automakers build their technology in-house or rely upon contracts with a few trusted component suppliers. Now Ford was developing technology in collaboration with tech companies, and found its old ways being questioned by coders. It had to abandon the auto industry’s years-long development cycles in order to build a connected car that would still be relevant when it rolled out off the lot, and it had to shift its focus from hardware to software, making the constantly upgraded smartphone the centerpiece of the Sync platform, Ford said. Ford Motor is getting more aggressive when it comes to development. It’s trying to follow in Google’s(s goog) footsteps by making Sync AppLink open source in hopes of one day making it the Android of the connected car. It’s even gone beyond software to open hardware development. A new program called OpenXC is inviting the nerdiest of Silicon Valley’s maker movement, such as open-source hardware maker Bug Labs, to connect to the car’s internal networks to build new instrument displays and other devices that can be installed in the car after it’s built. And beyond development, Bill Ford has started to directly invest in tech companies with the blessing of his board. Ford co-founded Fontinalis Partners, which invests in next-generation mobility technologies. In this case, mobility is both used in the wireless sense and the transportation sense, and for Ford it’s an opportunity to pursue both his technology and environmental ambitions outside of the confines of his company. Fontinalis has invested in car-sharing startup Wheelz (since bought by RelayRides) and Masabi, which builds smartphone ticketing apps for public transit. Fontinalis has also taken stakes in a lot of parking spot location and reservation startups such as ParkMe and Streetline. According to Ford, building intelligent parking apps solves a critical resource problem: all of the fuel consumed in urban areas by drivers looking for parking spots. There’s a larger picture than just building more technologically advanced lower-emissions vehicles, Ford said. Cars have to be part of larger complex networks built by myriad of cooperating players. Ultimately it’s in the creation of the inter-networked vehicle that Ford hopes to make one of its biggest contributions to the future of automotive technology. When Ford stepped down as CEO in 2006, he became a technology evangelist for his company. In his speeches before venues such as the TED conferences and the GSM Association’s Mobile World Congress, he’s expressed ideas you wouldn’t normally expect an auto executive to utter. 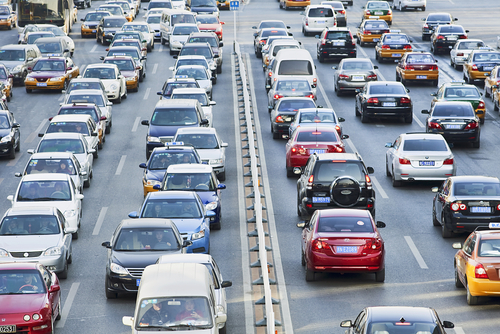 Today there are about 1 billion cars on the road. In 2050, Ford Motor is projecting that number will grow to between 2 billion to 4 billion, which is a recipe for global gridlock. But Ford said that networking vehicles could alleviate much of that gridlock. Cars on the highway would essentially form constantly morphing massive ad-hoc mesh networks using a secure form of Wi-Fi, which would allow them to communicate their speed, trajectory, braking and eventual destinations to other vehicles right next to them as well vehicles far down the road. Those communicating vehicles could not only help each other avoid accidents, but could allow drivers to select optimal routes based on prevailing traffic conditions. At Mobile World Congress in 2012, Ford elaborated on that concept even further, painting a future where cars would connect to traffic management infrastructure that could coordinate the activities of all vehicles on the road as well as a city’s other transportation infrastructure form pedestrian crosswalks to bike lanes. Cars could be spaced optimally for traffic flow, and vehicles heading toward similar distant destinations form “platoons,” separating them from soon-to-be-exiting traffic. In my conversation with Ford, he hedged a bit when talking about the logical conclusion of such an internetworked system of vehicles. He was reluctant to say that drivers must give up their autonomy entirely, which is understandable given who Ford is and what Ford Motor Company does. Since the days of the Model T, the auto industry hasn’t just sold cars, it’s sold the idea of freedom — the mythos of the open road. The networked vehicle future he’s describing nullifies that myth, replacing it with a system in which the driver ceases to be an individual actor, letting his vehicle be guided by a network intelligence taking its cues from millions of cars sensors. It’s a social compact of sorts in which individuals trade in their autonomy for the assurance that everyone can get to their destinations by the most efficient means possible. But it’s a compact that a lot of people won’t want to accept. That means there will have to be varying levels of choices for opting in and out of autonomous driving; at least initially, Ford said. But he acknowledged that at a certain point in the future, every driver would have to opt into the system to some extent. On rural highways or suburban drives, there may be no need to relinquish control of our vehicles, but in mega-cities where millions of vehicles are traversing the streets simultaneously, such traffic management systems will be crucial; otherwise, no one would ever get anywhere. If the automobile is about to undergo a massive transformation akin to the mobile phone’s transformation last decade, is Detroit destined to lead it? Or as with the mobile phone, is the future connected car bound to emerge from Silicon Valley, where companies like Google(s goog), Apple(s aapl) and Tesla Motors(tsla) will take over the role as innovators? It was a Silicon Valley company, Tesla, that produced the first highway-capable electric car — a feat many automakers said couldn’t be accomplished for another decade. Compared to the breakneck speed at which Silicon Valley moves and the risks it takes, Detroit is plodding and conservative. In one sense, Detroit isn’t going to change. When it comes to technologies that impact how the car is driven, Detroit will always move slower than the tech industry because the stakes are simply too large. A malfunctioning app or a buggy OS is one thing in a smartphone, but in car moving 60 mph such a glitch could prove fatal. New automakers like Tesla are challenging these old assumptions on how nimble a car company can be, but in general Detroit isn’t apologizing for its caution. When it comes to its approach to innovation, Ford said his industry is changing rapidly. Gone is the attitude that all technology needs to be developed in-house, as is the attitude that every automobile most be a tightly locked box of proprietary technology, Ford said. Ford Motor will have a lot to contribute to that innovation, Ford added, but the company now readily acknowledges it will be one of many companies whose technology powers its future connected cars. As you might expect though, the tech industry still wants Ford and the other automakers to move at a faster pace. Google is reportedly interested in building its own cars to prove its concept of the driverless vehicle, impatient with the slow progress of the automakers. Ford, however, said he isn’t necessarily viewing Google is a potential future competitor. Rather he sees it as a company trying to tackle the same problem as Ford with a different approach. Google’s autonomous car is a fiercely independent car, relying on its own sensors and smarts to navigate the world around it. Ford’s autonomous car will rely on sensors as well, but it sees the big promise in the inter-networked car that communicates with its peers. According to Ford, both views are just as valid. In order for cars to drive themselves, they’ll need to both see independently and listen to one another. Ford doesn’t believe that his company’s vehicles will become empty vessels for Google or any other tech company’s entertainment or driving technology, but he also readily admits that Ford can’t truly innovate without their help. Ford Motor needs to become part of the tech industry, not stand aloof from it, he said. That might be a tough pill for the auto industry to swallow — like Ford said, it’s an insular industry in an insular town — but the bigger problem might be convincing everyone else of Ford’s change of heart. A quote often attributed to Henry Ford about the creation of the automobile goes “If I asked people what they wanted, they would have asked for a faster horse.” You can read that quote in many ways, but one interpretation is that people expect innovation incrementally — a transformational innovation like the Model T isn’t an easy thing to immediately grasp. “We’ve gotten back to that truism unfortunately as the years went on,” Bill Ford said. People aren’t expecting much from automakers from year to year or era to era. In the 1970s they asked Ford for more heavily muscled muscle cars, until an oil embargo tipped consumer demand in favor of fuel-efficient Japanese cars. In the 1990s with gas prices declining, consumers called for larger SUVs, and in the last decade drivers once again demanded more fuel efficiency. Ford Motor has basically spent the last 30 years making faster horses, Ford said, but what Ford Motor Company plans to do in the next decade is build the Model T of the 21st century. If Ford doesn’t build that new Model T, then Silicon Valley most certainly will. Regarding relayrides and car sharing – Both the car owner and person who hired the car will get sued if there is a serious accident – under the grounds that, legally, the driver was an “agent” or employee of the person who hired the car. I don’t want an over-engineered car with a thousand potential failure points, that thinks it knows when to lock my doors. I see a vehicle as a tool. I want manual everything. The only justifiable use for a computer in a vehicle is to adjust fuel / air mix. The Edison 2 VLC has demonstrated what can be accomplished when you throw out all the crap and focus on efficiency. Henry Ford’s great leap forward was not the assembly line, (Colt Repeating Arms) or even the concept of growing his market by making a car affordable to the masses (Ransom Olds, the curved dash oldsmobile). it was his stubborn idea that he had to own the entire operation and be able to control Pricing, Costs, marketing practices, and manufacturing technology in order to expand his operation to the size of the perceived market. His prime objective was expansion rather than profit or stock price; which was antithetical to the common business concepts of the time. He was frequently criticized for this, anti-status-quo attitude, so avoided Wall Street because the financiers interest in enrichment of early investors could only come by tapping the revenue stream that he used for expansion, while avoiding the debt load that brought many good companies to ruin. The balancing act that he brought off from 1900 to the end of his life in order to keep his independence and follow his expansion above all ideal, required talent, drive, understanding, inspiration and ability. These were his true contribution. Is this the next Headline? Google acquires General Motors or General Motors acquires Google? Software eats Hardware! Thatâ€™s clear! THE NEXT â€œMOBILEâ€ IS THE â€œAUTO-MOBILEâ€ AND DETROIT THE NEXT VALLEY? The automobile OEMs are in the best position to disrupt Silicon Valley and become the next valley. And so are the industrial OEMs from GM and GE to Boeing, to Lockheed, John Deere and Philips. But why? Bill had it right early on, although his company was not prepared to hear that car ownership was not the only way to profit from automobiles. As a ZipCar user who does not own a car, it has become my reality. Sure, Iâ€™ll stuff a GT40 in may garage at some point, but otherwise I have no desire to own a car. Iâ€™m 47, not 27. The auto industry will move in the same open platform direction as the rest of the PC industry, although it may be more like mobile where facilitation through APIs levels the playing field. I look forward to the opportunities in designing experience in cars. One of my projects at MPD at Northwestern next fall is a mobile software product. Itâ€™s in the Ford Design Center, so click my name if that would be possible. I did work at Nokia Here, and have been playing around with driving incentives and gamification. Connected cars, autonomous cars are just faster horses ,we need more, we just don’t know what yet and if we ever get there.